Canadian shoppers want a more personalized experience, and according to Salesforce.com Inc., retailers aren’t listening. 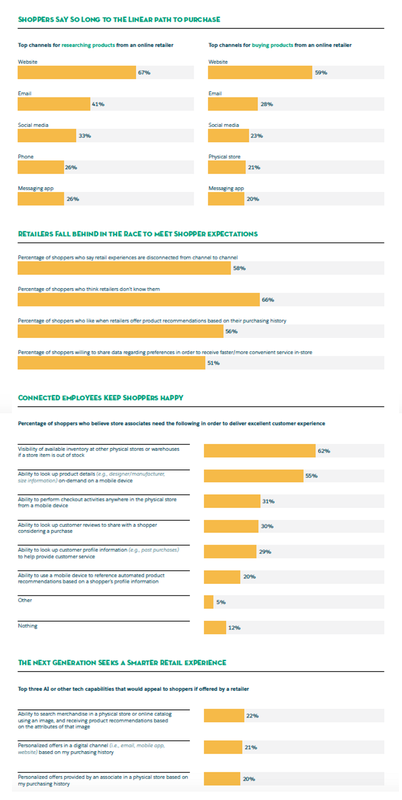 For its third annual Connected Shopper report, the customer relationship management (CRM) giant interviewed more than 1000 Canadians about their use of technology in the shopping process, and discovered that while Canadian consumers are more likely than ever to research and shop on multiple channels, many believe retailers are doing a poor job of following them around. 66 per cent felt retailers didn’t know them. 20 per cent said they would like to see personalized offers from associates in physical stores based on their purchase history. For more information, check out the infographic below (click for a larger version).